A touching, tragic album from Gaslight Anthem frontman and his “inspiration”. At Reading Festival last year, Gaslight Anthem frontman Brian Fallon introduced to the crowd to a guy who had joined them on guitar for a few songs. "This gentleman right here is named Ian Perkins," he told the thousands of people in the crowd. "People always ask, ‘Is that your roadie?’ No. He’s more than that. He’s our inspiration. He’s our wings beneath our wings." It wasn’t a point that needed proving, but by teaming up with Perkins to form The Horrible Crowes, Fallon has done just that, cementing the strength of their personal and professional relationship with these 12 stirring, searching, soulful songs. 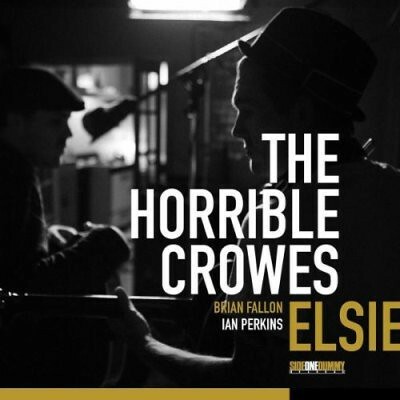 What Elsie isn’t is a Brian Fallon solo album. Neither is it a Gaslight Anthem record. Certainly, Fallon’s distinctive vocals – heartfelt and bruised, ragged and raspy – will recall the band that, in the last couple of years, has made his name. But really, these songs define themselves as the product of two fertile, fabulous minds. Opener Last Rites is a soft, sad and short introduction to the album. Underpinned by an elegiac piano line similar to that on the beautiful Eels song Spunky, it sets the sombre mood of what’s to follow. An album for dark, stormy nights when you want to shut yourself away from the world, Sugar, Cherry Blossoms and Ladykiller are similarly sultry and wistful, full of poignant regret and what ifs – contemplations and bittersweet celebrations of all the people you’ve loved and lost. It’s not all mournful ruminations, though. Mary Ann is a rough, gruff, bluesy stomp that channels (and references) Tom Waits; Behold the Hurricane a chugging bundle of trembling nerves perpetually on the verge of exploding; and Go Tell Everyone is a raucous, visceral growl of a song with a majestic, exuberant chorus, equalled only by the finger-clicking soulful riff of I Witnessed a Crime. But then, for the last three songs, the desolation and desperation returns, Black Betty & The Moon and Blood Loss cranking up the poetic romanticism and sense of despair before the devastating pathos of final song I Believe Jesus Brought Us Together. A lilting, atmospheric ode to love, life and death, it drops to its knees with wounded grace as it tries to makes sense of a world gone wrong through the hope that things can and will get better. It’s a beautiful end to a touching, tragic album. Soulful side project from Gaslight Anthem frontman. Brian Fallon is better known for adding the distinctive rugged vocals to rock n rollers the Gaslight Anthem and so fans may be surprised by this stripped down affair, mostly devoid of the punk attitude that drives many of their tracks. Surprised maybe, but far from disappointed as Fallon’s vocals appear at their most fragile, haunting and beautifully soulful. It would be easy to see Elsie as Fallon’s solo album given that his bare vocals are the main focal point of the album but they are only able to achieve their mournful potential against the backdrop of the simple yet brilliant musicianship of Ian Perkins; Gaslight Guitar tech and personal friend of Fallon. The albums short opener 'Last Rights' sets the tone of the album, a slow burning and sorrowful tribute to lost love. This is followed by 'Sugar' with its ghostly harmonies and sultry feel. By the time the second track has come to close you’ve already locked your bedroom door, pulled the duvet over your head and given yourself up to reflecting on the highs and lows that life has to offer. And that’s where 'Behold the Hurricane' comes in to offer a more upbeat sound to the album. This song like, many on the album, has a strong sense of Americana to with the souring Springsteen-esque chorus being perfect listening material as you embark on a road trip in your Chevy. Other bursts of energy on the album come in the form of 'Mary Ann' and 'Go Tell Everybody'. The former is packed with dirty riffs and solos courtesy of Perkins whilst Fallon struggles to contain his hot-blooded passion. Similarly, 'Go Tell Everybody' is a riotous affair with gravel encrusted vocals and an anthematic chorus. The albums highlights however are the slower, more soul searching tracks such as 'Black Betty & The Moon', 'Bloodless' and 'Lady Killers' which showcases Fallon’s ability to write darkly poetic and tragic lyrics which actually caused a shiver down my spine. My personal favourite on the album is closer 'I Believe Jesus Brought Us Together' which manages to pack an array of unifying human emotion such a fear of dying, loneliness and betrayal into a heart wrenching 5 minutes. The reason i pick this out from many fine pieces of songwriting on the album is that it provides that perfect moment when a record finishes where the listener dare not move in case they should emerge from the emotion the album has created. Elsie truly is beautiful and you need it in your life.